The programme of events celebrating Italdesign’s fiftieth anniversary gets into full swing, at the fourth edition of Turin Auto Show Parco Valentino, which will be held from 6 to 10 June. Italdesign’s presence at the Turin Show will be organised in a variety of places and at different times, so that the greatest number of fans can take part in the numerous initiatives. Italdesign’s latest creation, Pop.Up Next, will be displayed, in a national preview, from 6 June and throughout the event, inside the stand located along Corso Massimo D’Azeglio. Thirty prototypes and production models that have marked the history of Italdesign and, in many cases, also that of mobility, will be on show inside the courtyard of Castello del Valentino, throughout the event. Visitors to the Show will therefore be able to see close up and first-hand authentic legends like the De Lorean DMC 12, immortalised for ever on the large screen by the Back to the Future trilogy, the Golf GTI which, between the Seventies and the Eighties was the dream of generations of newly qualified drivers, or the Fiat Panda, here in the “safari” version in the 4×4 Strip concept. The Show has also been the occasion for developing Italdesign 50, an app for mobile devices, both Android and iOS, which gives the history of each of the models exhibited inside the courtyard. Visitors will be able to download the app free of charge from the relevant stores and view a fact sheet for all the models displayed inside Castello del Valentino directly on their smartphones. A fact sheet will give a brief account in Italian and English of each car’s history, technical specifications, curious “behind-the-scenes” facts, as well as images, preparatory drawings and exclusive videos kept in Italdesign’s archives. 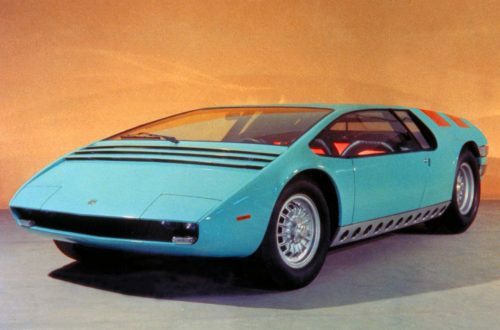 The models exhibited and featured in the app are: Bizzarrini Manta, Golf GTI, Lancia Megagamma, BMW M1, Fiat Panda 4×4 Strip, Italdesign Machimoto, De Lorean DMC 12, Italdesign Capsula, Italdesign Aztec, BMW Nazca C2, Italdesign Biga, Bugatti EB 112, Lamborghini Calà, Italdesign Structura, Bugatti 18/3 Chiron, Maserati Buran, Aston Martin Twenty Twenty, Volkswagen W12, Alfa Romeo Brera (prototype), Chevrolet Corvette Moray, Ferrari GG50, Ford Mustang Concept, Italdesign Quaranta, Italdesign Brivido, Italdesign GTZero, Zerouno, Duerta and Pop.Up Next. Saturday 9 June is Fan Club day: from 9 in the morning, fans of the Fiat Panda, Alfa Romeo Brera, Maserati 3200 GT, VW Golf, Audi TT and BMW Mini will meet in the Murazzi area. Italdesign was responsible for the engineering development of the last two models. About three hundred people and a hundred and fifty cars are expected from all over Europe. The crews will depart at 10 and, after a parade through the city streets, will reach the Castello del Valentino courtyard. Duerta represents the second chapter of the Automobili Speciali brand, dedicated to the production of exclusive ultra-low series cars will lead the rally. Click here to download the images of the cars on show at Parco Valentino 2018.